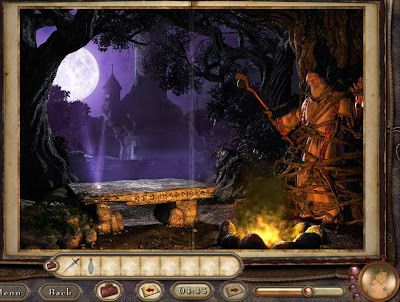 Azada: Ancient Magic a game that combine adventure/hidden objects with a large variety of unique and interesting puzzles solver. you will be trying to help the young Titus disarm a magical menace. The game contains a large library of classes literature where you help legendary characters. The game consists of a series of 24 storybooks and more which is structured around solving those puzzles. each storybook may contain clues, puzzles, and many more all of which fit together to solve the main riddle of the book. you'll be using objects where appropriate and flip back and forth through the book. after solving a set of books and collecting the corresponding character cards, you'll need to take them to the upper level of the library to the strange looking machine. Also you have to complete a few short mini games to get things done. This game require you to think and experiment things on each book stage. It is really interesting and make you think all the time, and train your brain solving the mysteries!